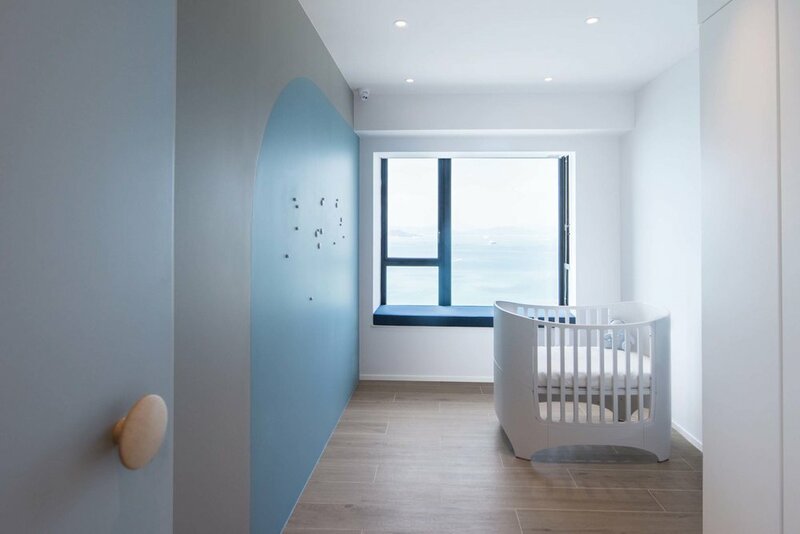 Bean Buro was tasked with refurbishing a 1,600sqft (149sqm) residential apartment at Bel Air apartments in Pok Fu Lam Hong Kong, for a young family with two children whom would relocate permanently from Oxford UK to settle in Hong Kong, at a location that is close to the ocean for improved wellbeing and tranquility. The apartment would have a master bedroom suite, a study room for the father who is a professional doctorate medical surgeon with lots of academic books and files, a room for a young child, and a flexible guest room that can be transformed into a baby room in the future. The seaside apartment would accommodate a baby grand piano in the lounge for the parents to enjoy playing with a view to the ocean. The first element is a curvy blue volume that forms half of the apartment; it begins its stream as a bookshelf with random niches from the lounge into a corridor that conceals the children room and guest room, and flows towards the master bedroom and forms a storage volume with a seating niche. The second element is a rectilinear grey concrete volume that forms the other half of the apartment; it begins from the entrance foyer that forms the backdrop of the dinning area, and takes its solid form towards the master bedroom while concealing a guest shower room, a walk in storage, and a study room which is connected with the master bedroom suite. The result is an overall composition that allows the deepest spaces of the apartment to be fluidly connected to the entrance and kitchen, forming a sociable open atmosphere for the family. An innovative solution is created to address the relationship between the parents spaces which are the master bedroom suite and the study room, the children spaces, and the common social spaces. In order to create privacy for the parents, a concealed pocket sliding door can be pulled out from the concrete volume to divide the master bedroom suite and study room away from the rest of the apartment. The sliding door has acoustic separation to ensure the noise from the children play spaces will not penetrate to the study room where the parent has to carry out focused works. To further increase privacy for the study room, an additional sliding door is designed to partition the study room from the master bedroom suite, this will allow flexibility for one parent to be sleeping in the master bedroom while another might be working in the study. When both sliding doors are opened, the two elements of the flowing blue volume and the concrete volume would appear to flow continuously throughout the entire apartment, fluidly connecting the parents spaces back with the open spaces of the apartment. The concrete panels used in the project were prefabricated from France which could be easily cut and assembled quickly, cutting down on site construction time. A long continuous LED light strip accentuate the concrete panels, controlled by the overall scene lighting control system for the apartment. The overall floor finish is a ceramic tile with wooden texture is used for the flooring which is durable as a hard surface but provides visual warmth to the space. The tiles also form the wall finish for the dinning area, creating a comfortable setting with a pendant light and an extendable table for six to ten people. In the children room and guest/baby room, a writable surface is created on a full height full width wall using a high quality chalk board laminate that can be composed into different wall patterns and colours. The study room has high density storage for books and filing, as well as a bespoke built in desk with cable management for computer and printers. A magnetic writable surface is integrated into the white walls of the room.